Like many school districts across the country, Jefferson County School District in Colorado is facing massive budget shortfalls. They were facing over $70 million is cuts over the next two years and desperately needed to supplement this lost income. So, they decided to sell advertising space on the one item they knew people would look at: their children’s report cards. So far, the only client is a state governmental entity called CollegeInvest which distributes college savings programs called 529s. The 2-inch advertisement appears on every elementary school report and the school expects generate around $90,000 over the next three years. The district, like many others, already sells advertisements on the school buses and most of the parents interviewed support the idea as long as discretion is used in the selection of the advertisers. In addition to buses and report cards, there are numerous untapped revenue streams within the education system. What about corporate sponsorships for each day’s lesson? How much harm could it do for the teacher to remind his or her pupils that “Today’s spelling lesson was brought to you by Fast Eddie’s Bail Bonds” or “This carpet time was made possible by Smirnoff Ice”? On their turn in the restroom, the kids could be informed that the ½ ply toilet paper was underwritten by Tucks Medicated Hemorrhoid Pads. Even the standardized tests should have some sort of revenue stream attached to them. You would not even be allowed to begin answering the math portion of the ACTs until you sat through the theatrical trailer for Love Actually. 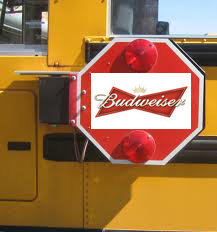 Bus sponsorships would actually prevent transportation confusion. It can be tough to remember you ride bus 103 and then transfer to bus 65, but what kid would forget that they are supposed to take the Manwhich Mobile before jumping on the Winchester Wagon? District parents are prudent in requesting stipulations as no one wants to bring grandma to the Kindergarten graduation ceremony sponsored by Dirty Doug’s Adult Bookstore & Bistro, but all in all it seems to be a good way to supplement waning tax revenue while giving local businesses a chance to support public education. In fact, I am not sure that we should limit it primary schools. I would have gladly taken a college tuition reduction in exchange for seeing someone dressed as Chalupa running around the common area or cheaper textbooks that featured a Pabst Blue Ribbon logo.